Mercedes-Benz already has a reputation for elegance and luxury, and it’s taking that approach to a brand new infotainment system. What’s especially interesting isn’t just the reinvented design, but also the target demographic: millennials. The German automaker is hoping to sell its new A-Class mid-sized sedan for under $40,000 with a tech-laden setup ready to go. I had the chance to go hands-on with MBUX on a test drive in Seattle and deeper into Washington State to see whether there was serious promise in the whole package. What Mercedes-Benz is attempting to do is ambitious. Not only is the company looking to offer a wide range of features and options, it’s also looking to build a dynamic machine learning voice platform that would rival the likes of Alexa, Google Assistant and Siri. Sheer hubris or an unbridled roll of the dice? Seeing an established automotive brand trying to play the role of upstart is a little odd in the era of Tesla, but that seems to be the intention here. Granted, what I tested was in pre-production, so I expected bugs and a lack of polish. Still, the parts that make up the whole sum are compelling. 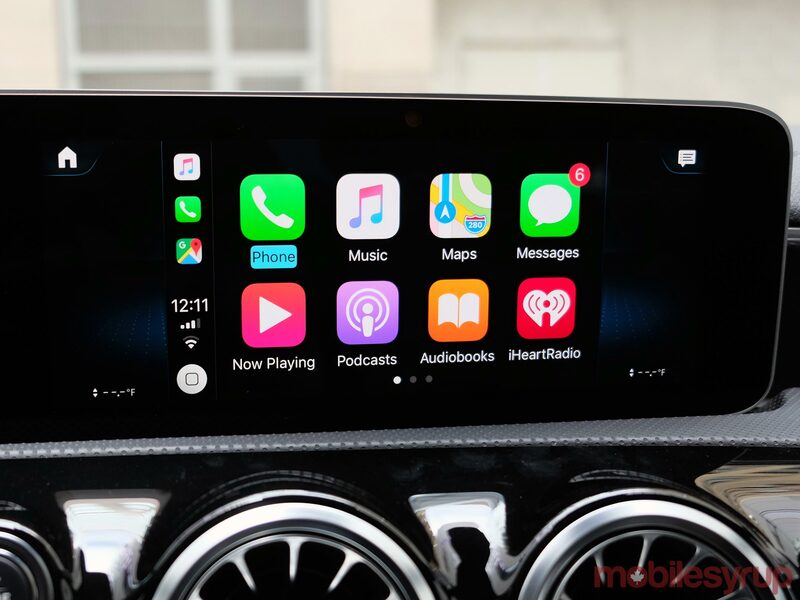 There’s CarPlay and Android Auto, SiriusXM, TuneIn integration, in-car LTE with a Wi-Fi hotspot, the cloud-based voice platform, Mercedes me access, and more. Navigation with augmented reality onscreen is going to be offered separately at the dealership. I was surprised when Mercedes reps told me that the company acknowledged drivers probably wouldn’t need the package if they had already chosen the Premium tier that includes CarPlay and Android Auto. 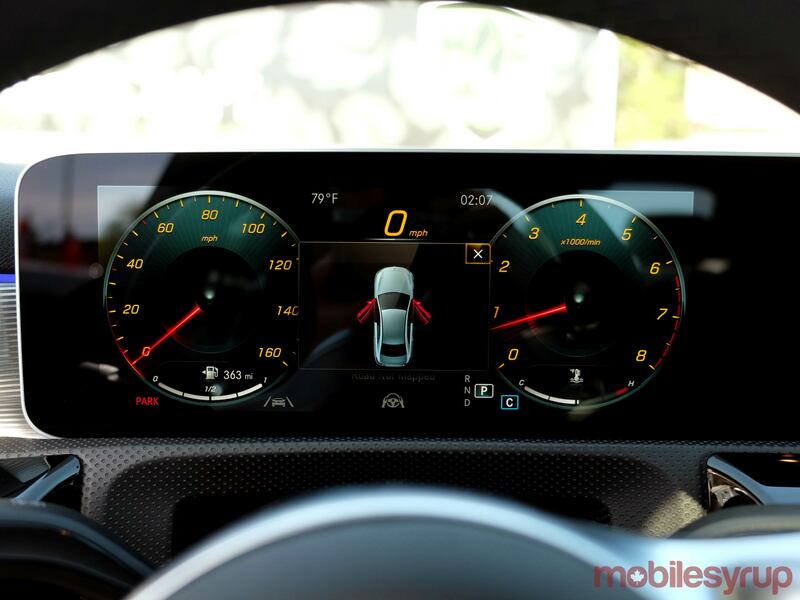 All of this is displayed on a screen stretching from the digital cluster in front of the steering wheel to the dash. The image quality is among the best I’ve seen in a car to date. Crisp, vibrant and responsive, the Nvidia graphics processor inside was put to good use. There’s a Qi wireless charging pad, albeit not one treated as a physical input. To use CarPlay or Android Auto, I had to plug into the USB port right in front of the pad. Interestingly, Mercedes went with USB-C ports throughout, forcing users to use USB-A adapters to connect devices. The touchpad in the centre console mimics a mouse and touchscreen, complete with haptic feedback and swiping abilities. Home and back buttons are easy to access. 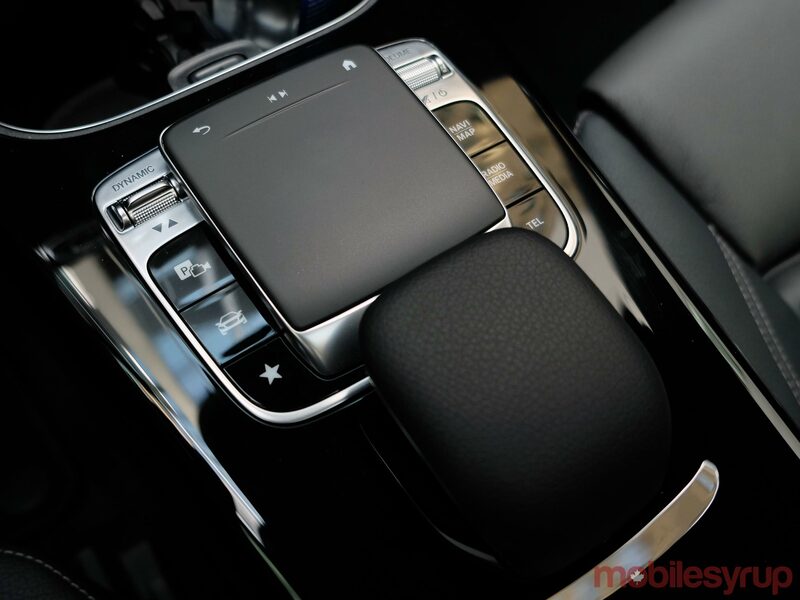 The steering wheel is also loaded with shortcuts to navigate some of the car’s functions. Anytime a company describes something as “revolutionary,” I feel a growing skepticism. That’s the term Mercedes uses to highlight MBUX’s voice platform, and I wish the hyperbole was kept under wraps until the proof was in the pudding. Company engineers built the platform to be two-pronged. 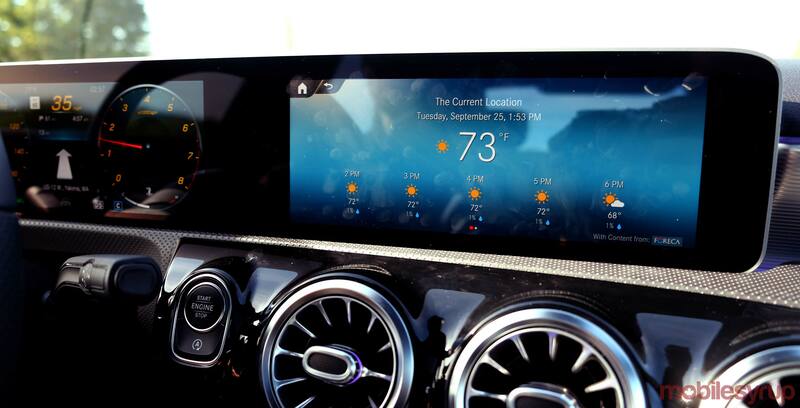 The embedded voice recognition sticks to basic commands and requests for controlling certain features in the car. The cloud-based element is supposed to turn up the dynamism, interpreting more conversational language and pulling in requested information from the cloud. Saying ‘Hi Mercedes,’ or ‘Hey Mercedes,’ triggers the voice assistant, and in my drive, it was quite good at perking up when called upon. The embedded SIM card is the conduit to the cloud, adding some real-time responses to a wide range of queries. For example, I asked it about the weather, and then about specific famous people, where it responded well. When I asked it about football scores, it seemed confused. I asked, ‘tell me who won in the NFL Monday,’ and it said it could find no games. When I specifically asked by mentioning the two teams who played, it gave me the score. This is a mistake neither Alexa nor Google Assistant would make. Even Siri would probably get it right. I tried asking questions with different phrasing to gauge how well it interpreted what I had requested. It was hard to detect a pattern because it was a little all over the place. Where it did well, it also fell flat, so I’ll reserve final judgment until I can test a final version at home. Despite that, there is a gaping hole the company must fill: music. I could verbally access radio stations, but not much else. To make this work, Mercedes will need to integrate music streaming services with full indexes to make artists and tracks searchable by voice. Alexa and Google Assistant can already do that with certain services, so they set the precedent. 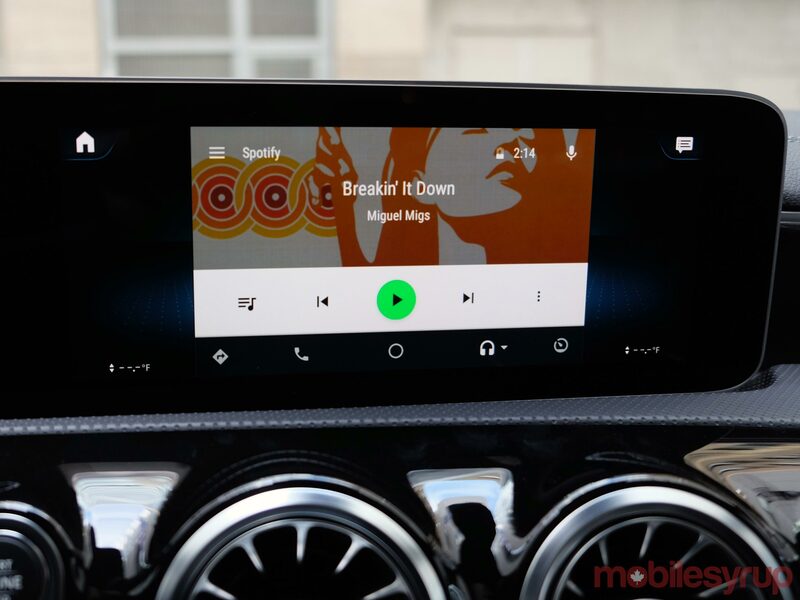 Reps said music was the next major feature they needed to address with the car’s voice features. Mercedes is working with SoundHound, specifically its Houndify AI platform, to make all this work. 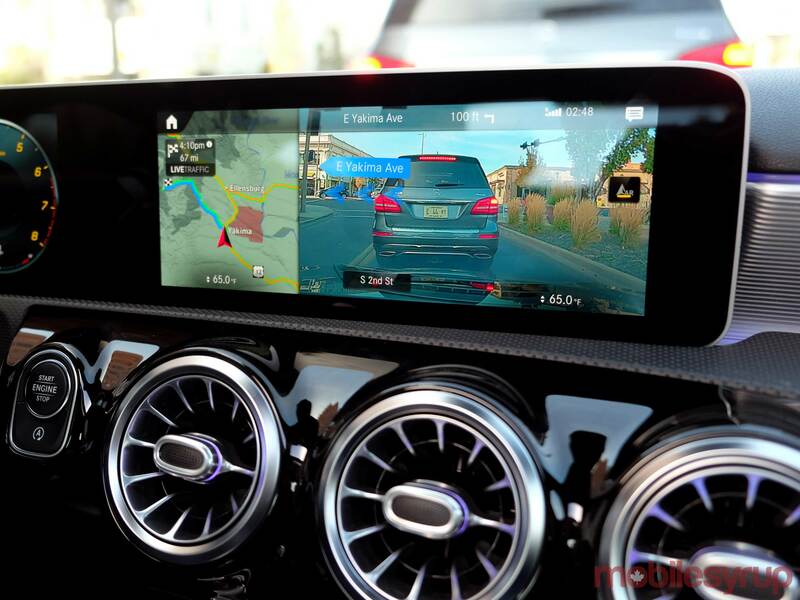 That means Mercedes will be able to make its voice assistant better over time, yet still calls into question whether it can hope to keep up with what the other popular voice platforms can do. Mercedes encourages drivers to acclimate with the different input methods. I could physically access MBUX through the touchpad, touchscreen or steering wheel. Throw in voice and you essentially have a quartet of options to go with. All of this is designed to keep your phone out of your hands as much as possible. 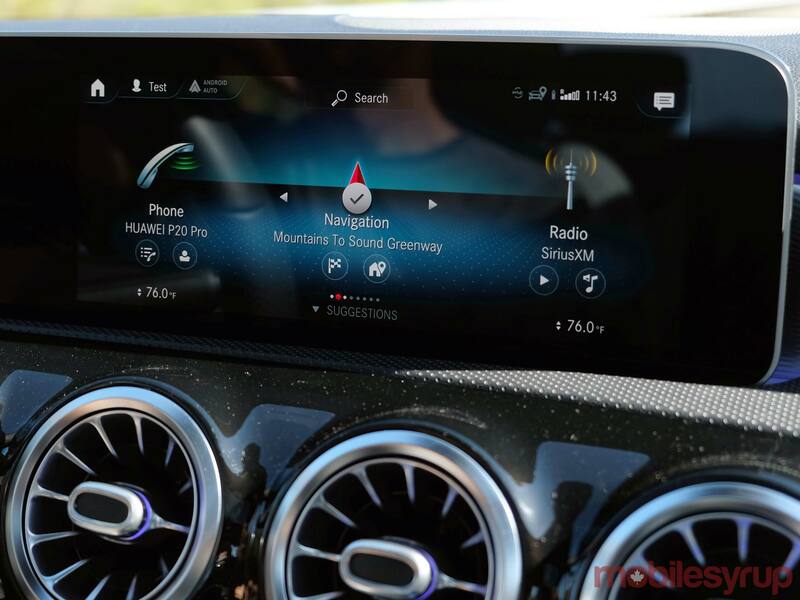 One of the caveats is that CarPlay and Android Auto can supersede Mercedes’ own voice assistant. How navigation or music works through voice depends on either platform. It’s much easier (so far) on Google Assistant than it is on Siri. Switching back to MBUX is easy, however, even if it does take an extra couple of steps. Selecting it from either interface is simple enough, and no different from what other automakers have done. There are three different screen layouts to choose from, all of which are aesthetically pleasing. The graphics are excellent for car screens, and it made me wonder what video would look like on it. No chance of doing that, unfortunately. MBUX is also being designed to recognize who’s in the car. One driver could have presets different from another, especially if you’re sharing the car with a significant other. I didn’t get to test this out, so can’t assess its viability. The in-car LTE comes with its own data plan options. Importantly, the cloud-based voice features are tied to Mercedes me services, which come free for three years. Not entirely an accident that it fits typical three-year leases for the company’s vehicles. Either way, the voice services are mutually exclusive of the LTE services. So far, pricing for in-car Wi-Fi is set at $15 for 1GB per month, $35 for 4GB per month, $70 for 10GB per month and $200 for 20GB for a year. There would be no contract terms and drivers can cancel plans at any time. Monthly data buckets wouldn’t carry over month-to-month, whereas the 20GB bucket doesn’t expire unless 12 months have passed. AT&T is the carrier involved, as it is with virtually every other automaker offering in-car Wi-Fi. The service will work in Canada and the United States without roaming fees, making road trips essentially borderless. I wasn’t able to try out everything in the Mercedes me service, particularly with the app, including remote start, lock/unlock, vehicle diagnostics, tracking and 24/7 concierge, among other things. The navigation package is an unnecessary add-on beyond the Premium package that brings in all the connectivity and features noted above. It uses ‘HERE’ maps, and comes with undetermined update schedule. The augmented reality part of it was interesting in that street names popped up with a forward-facing camera looking ahead onscreen. I didn’t notice points of interest or other contextual information thrown in, but plans are to expand and include that. The A-Class sedan isn’t expected to come to market until Q1 2019, but the A-Class Hatchback will be before the end of this year. Mercedes confirmed that vehicle will be equipped with the MBUX system. The rest of the company’s range of models will get the new system over the next two years. If you’re driving a pre-2018 Mercedes, you won’t get MBUX as an update. Given what I tested wasn’t final, the bugs were still apparent, but some of the polish was equally so. Visually, I found little to dislike, whereas functionally, there are still question marks over how effective MBUX will be from the start — and whether it stays relevant three years later.